Puttu, a steamed rice cake, is a favorite breakfast of many South Indians, especially Keralites and Tamilians. Puttu can be made from different flours such as rice flour, wheat flour, ragi flour and tapioca flour,depends upon one's interest. Soak the rice in water for 3 hours. strain it and dry it for some time. Pound it in the mixi to make a finepowder. Sieve it and remove the bigger grains, if any. Roast the rice flour in a pan for about 3-5 minutes. Mix the rice flour with half the quantity of coconut, water and salt. It should not become dough, instead itshould be coarse powder, adequate enough for steaming. Place about 2 spoons of grated coconut in the puttu maker on top of the small sieve. Then put a handful ofmixed rice flour on top of it, followed by 2 spoons of grated coconut on it, again put rice flour on top followed bygrated coconut on the top. Place the bottom attachment of the puttumaker on the stove with 3 cups of water. Place the puttumaker on the bottom attachment properly and ensure the steam is not passing outside through thesides. Light the stove and allow it to cook for about 3-5 minutes. You can see the steam coming up from the top, followed by the aroma of the cooked puttu. Now it is time to remove from the stove and you can get two layers of puttu. Since it is a dry breakfast it should be eaten with vegetable stew or some curry made of pulses like moong gram, bengalgram, etc. Egg curry is also a good combination with puttu. 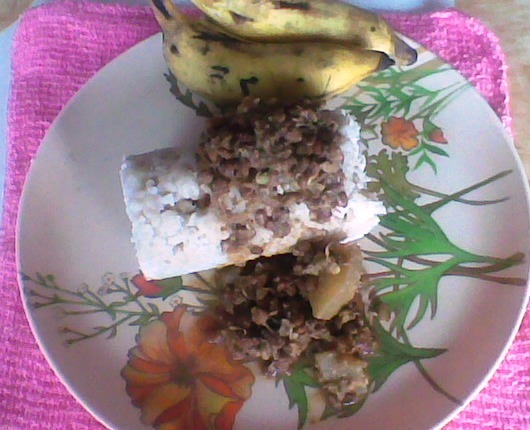 Some people prefer to eat puttu with ripe banana, and some others enjoy it just adding sugar and milk. These days instant puttu rice flour packets are available in many stores for ready use. Instead of the traditional puttumaker, you can also use the puttu maker which can be easily placed on top of the pressure cooker for steaming. The puttumaker will be available in many of the Indian stores.